Reference number for this case: 20-Oct-54-Zinnkoepflé. Thank you for including this reference number in any correspondence with me regarding this case. "While she helped pick up the grapes last Monday at the Zinnkoepfle, a girl of Soultzmatt, Miss Mimie Fleck, saw in full day, at a height from 2.000 to 3.000 m, a shining flying object of a lengthened form. The apparatus, coming from the direction of Guebwiller, advanced at a very high speed, then, arrived above the vineyard of Soultzmatt, it stopped during a few moments to finally disappear in direction of the North." The case, although of very poor description, was briefly publicized in the national Press, and later in ufology catalogs. The two "skeptics" Gérard Barthel and Jacques Brucker wrote in 1979 that they located the witness, who said that it was early in the morning, that there was no stop, that she had been unable to evaluate an altitude, and that she had not said it was an object, but only a luminous phenomenon. Yesterday morning, around 7:40, Mr. Pierre Ackermann, employee at the tissue factory of Guebwiller, saw, while he came out of the street of Lure, a round disc of an intense brilliance, coming from the heights of Oberlinger and which disappeared behind the Kreyenbach. The whole had lasted only approximately 10 seconds. What Mr. Pierre Ackermann states to have been a saucer moved without noise at a height of 300 to 400 meters. The disc measured at this distance approximately 30 to 40 centimeters. It is to be noticed that Mr. Pierre Ackermann was particularly well placed, to follow the evolution of the saucer, since he moved perpendicular to the latter. Two pupils of the Classic Boys College, who at the same hour went to school, also affirm to have seen the flying disc. In addition, a young man of Rouffach, Mr. Lucien Flesch, affirms to have seen, while he was going to his work and that he passed near Issenheim, a spherical object, with metallic reflections. This object, which had a diameter of approximately 5 or 6 meters, seemed to be stopped one meter above the ground. Terrified in front of this at the very least strange appearance, the young man pedaled at full speed and reached his workplace in Guebwiller, where he told his colleagues about his weird adventure. In addition, five residents of Bergholtz who went to their work, also reprtedly saw this sphere, while it rose in the airs. Mr. Flesch, wanting to check whether this mysterious machine had left some trace, returned to the place, but however found nothing particular there. While she helped pick up the grapes last Monday at the Zinnkoepfle, a girl of Soultzmatt, Miss Mimie Fleck, saw in full day, at a height from 2.000 to 3.000 m, a shining flying object of a lengthened form. The apparatus, coming from the direction of Guebwiller, advanced at a very high speed, then, arrived above the vineyard of Soultzmatt, it stopped during a few moments to finally disappear in direction of the North. Several testimonies were gathered in Alsace. One of the witnesses, Lucien Fiesch [Fisch] saw close to Issenheim a spherical machine of approximately 6 meters in diameter which stationed within one meter of the ground. Frightened, Mr. Fiesch [Fisch] went away and regained his workplace. "While going to gather the grapes in Zinnkoeplfer, Miss Fleck saw at 200 or 300 meters of altitude, an unknown shining object of lengthened form. The apparatus came from the direction of Guebwiller and advanced at high speed, then arrived above the vineyard of Soultzmatt, it stopped during a few moments to move then towards the north." The two authors note that the details are vague, that the time is missing, that there is a stop and low altitude, and that one can compare the observation to that of a meteor. To be sure of this, they indicate, they carried out a long investigation to find Miss Fleck, which was difficult for she had married, but that by chance they found her and that she told them that the observation had taken place early in the morning and that there had been no stop. She specified to them that she could not determine altitude for the observation was too short and that she did not talk about an "object" but about a luminous phenomenon. Barthel and Brucker conclude from this that she did not see a flying saucer but a meteor, and are indignant that this case however appears in "a catalogue", "its card exists, it is described." While she helped to gather the grapes in Zinnkoepflé, a girl of Soultzmatt, Miss Mimie Fleck, saw in broad daylight, at a height from 2.000 meters to 3.000 meters a shiny flying object of a lengthened shape. The apparatus coming from the direction of Guebwiller advanced at very high speed then, arrived above the vineyard of Soultzmatt, it stopped a few moments, to finally disappear in direction from North. Christian Valentin indicates that on October 18, 1954, in broad daylight, a girl sees, at a height from 2000 to 3000 m, a brilliant object of elongated form. Coming at high speed from the south, the apparatus stops a few moments above the vineyard of Soultzmatt, before setting out again to disappear towards the north. Luc Chastan indicates in his database that in the Haut Rhin in Soultzmatt on October 20, 1954 at an unknown hour, "Whereas she helped to gather the grapes in Zinnkoepflé, a girl of Soultzmatt, saw, in full day, at a 2.000 m to 3.000 m height a shining flying object of a lengthened form. The apparatus coming from the direction of Guebwiller advanced at very high speed then, arrived above the vineyard of Soultzmatt, it stopped a few moments to finally disappear in the direction of the North." The source is indicated to be my website, by a link to the old address of the home page. As she helped harvesting, last Monday at the Zinnkoepfle a girl from Soultzmatt, Miss M. F., saw in the daylight at a height of 2000 to 3000 m, a bright flying object, elongated. The craft, advancing from the direction of Guebwiller at a very high speed, then came over the vineyard of Soultzmatt, it paused for a few seconds and finally disappeared in the north. Why don't Barthel and Brucker indicate the date of publication of the newspaper that they quote? Don't they constantly make this criticism to the ufologists who do not share their ideas? Isn't the omission of the date of publication for this case - they do give publications date in other cases - a good way to make it difficult to check whether they give a complete and correct version of the source? According to Barthel and Brucker, the newspaper L'Alsace wrote "200 to 300 meters". According to the author of "Buhl, a page of history", the newspaper L'Alsace wrote "2000 to 3000 meters" and this was confirmed to me when I got hold of the newspaper article. Could Barthel and Brucker have deliberately changed these values to serve their cause according to which the witnesses who believe to see flying saucers within 300 meters really see meteors which are much higher, due to their inability to differentiate such abysmally different distance such as 300 meters and 3000 meters? Barthel and Brucker complain that the report is vague. However, according to "Buhl, a page of history", the firstname of Miss Fleck is in the newspaper, while they abstain from indicating it. May it be that they do not want anybody to try to check if they really found Miss Fleck? Didn't they make the report more vague by removing her firstname? Meteors seen from the ground quite often give the impression of a short stop. Barthel and Brucker do not seem to know that, and justify the need to find the witness as follows: if there is stop, the meteor explanation is weakened. They say to have found the witness, and that she told them that she did not see a stop. Is it going too far to suspect that perhaps the witness had really observed a short stop, as it often occurs, and that Barthel and Brucker invented their "long investigation " to find the witness, and thus invented her remarks? Why is there no precision of any sort about this long investigation, its circumstances, the new name of Miss Fleck who they said is married since? When, where, how? Is it legitimate that they complain about the "vagueness" of the others all while not giving themselves the least verifiable indication on their remarks and investigations? Barthel and Brucker write that this case appears in "a catalogue". They take care not to specify which catalogue, nor in which context it appears there. Is it foolish to think that the only catalogue in question here is the collection of news clipping patiently collected by Mrs. Guedelot for the readers of the ufology magazine "Lumières Dans La Nuit" and the magazine's investigators, so that they learn what appears in the Press and consider and investigate such reports? Which catalogue had regarded this case as that of an observation of a true flying saucer? It is unreasonable to think that there is no such catalogue, which makes it unsurprizing that Barthel and Brucker feel obliged to imagine, I quote, page 33: "Let us note by the way that if it were reported in a book signed of a prestigious name (ufologicaly speaking), such a case would take a great importance and would not be doubted!! All researchers would integrate it into his studies". These authors are reduced to imagine things; is this rational, or rationalist, or isn't it rather quite simply intellectually dishonest? What is also remarkable is that Barthel and Brucker did not seem at all concerned in getting very essential information: silent or noisy? With or without a trail? This makes their explanation hardly well established, and it could just as well have been a jet plane. One must unfortunately note that after Barthel and Brucker, the case did enter several catalogs, and without any mention of the explanation they gave. The place called the Zinnkoepflé is located at the boundary between the municipalities of Westhalten and Soultzmatt, in the department of Haut-Rhin. The thing, we are told, came from Guebwiller, roughly in the south of the observation place, then continued north. This means that there has been no change in direction, or no significant change in direction, and the thing had to pass over or "near" the girl who likely had to turn around to follow it. So, this is an unidentified, possible plane or meteor, with insufficient information. 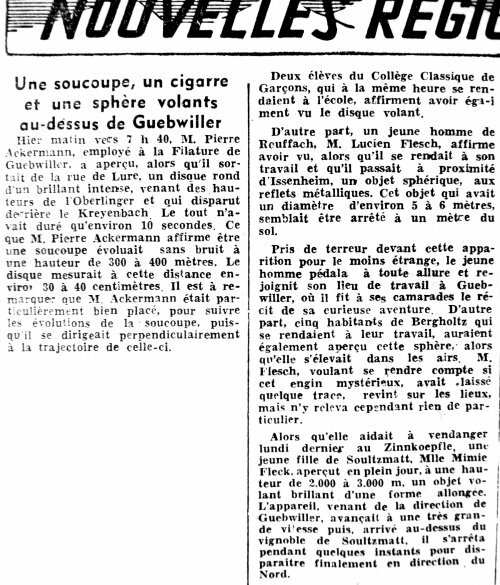 [la1] Article in the regional newspaper L'Alsace, Mulhouse, France, page 5, October 21, 1954. [bb1] "La Grande Peur Martienne", book by Gerard Barthel and Jacques Brucker, Les Nouvelles Editions Rationalistes publishers, pp 31-32, 1979. [bp1] "C'était en 1954 - Cela fait déjà 50 ans", article on the web page "Buhl - Page d'Histoire", Franc, at perso.wanadoo.fr/mjc.buhl/Elfaluter/1954.htm. [cv2] "Mythes et Réalités des Phénomènes Aériens Non Identifiés - Histoire des soucoupes volantes en Alsace jusqu'en 1980", book by Christian Valentin, Grimoires d'Alsace publishers, France, page 46, 2012. 1.1 Patrick Gross May 27, 2010 Addition [la1]. In the notes, addition of "and this was confirmed to me when I got hold of the newspaper article." 3.0 Patrick Gross April 24, 2014 Addition [cv2], summary, Explanations. 3.1 Patrick Gross June 4, 2015 Addition [sp4].